Though many of us have dreamed of being a fashion designer when we grow up, Remi didn’t wait—she became one before she even graduated high school. Remi’s passion for style and frustration with the lack of cute college apparel led her to add a DIY twist while repping school spirit. One Instagram post later, everyone wanted her designs. 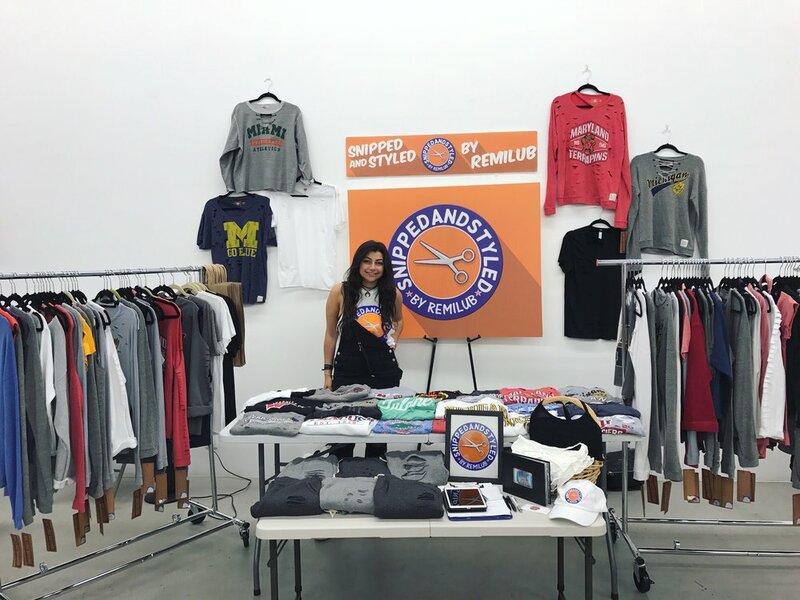 While a full-time student, Remi has gone from cutting up her own shirts to running a successful fashion business, Snipped and Styled, which has caught the eye of Cosmopolitan, Seventeen, designer Rebecca Minkoff, and stylish collegiettes everywhere. Remi’s creativity and passion make her the true definition of a #girlboss—and she’s just getting started. What do you consider your greatest achievement to date? It is so heartwarming and makes me feel great about all the hard work I have put into the company. Second to that would be building my e-commerce website. This was totally not in my skill set but I did a lot of research and taught myself. I looked through websites I loved and modeled mine after them. Overall, I am very proud of what I have accomplished. What inspired you to become an entrepreneur? I was always interested in business and fashion, and I love connecting with people so starting Snipped and Styled was simply me following my passions. Once I was accepted to Syracuse University as a high school senior I was so excited to show my school spirit but saw a huge lack of stylish fan gear. I decided to take this problem into my own hands (literally) and snip my college t-shirts. I posted my designs on Instagram and the feedback I received was overwhelming. From there my business was born when people started asking me to “snip and style” their college T-shirts. Since that original instagram post, the business has grown exponentially and I have learned so much. How have you balanced running your own business and succeeding in school? One of the biggest challenges I face as a full-time college student is managing my schoolwork and my business. I am lucky that as an advertising major at the S. I. Newhouse School of Public Communications at Syracuse University and an entrepreneurship minor, I have a lot of opportunity to incorporate my business into my studies and vice versa. Even so, it’s important to respond to customers promptly and meaningfully. It can be challenging at times, like final exams, sorority events, and just meeting day-to-day commitments. I am very fortunate to have an awesome team of girls working with me. My professors have been wonderful too. Most know about and support my business and understand things like the time I needed to miss a class to fly to NYC to film for a reality TV show! Overall, managing both school and business can get pretty overwhelming but I have awesome support which makes it all manageable. Are there any “girl boss” entrepreneurs you look up to? Rebecca Minkoff hands down. My first trunk show ever was with her and meeting her was incredible. She is a huge inspiration. She has incredible reach, does amazing things for women and she is so innovative. She is one of the first designers to work with bloggers and become a master of the art of influencer marketing. She is super tech savvy and cutting-edge. She incorporates drones to get aerial footage of her runways. She has helped pioneer wearable technology like device charging bracelets, and built in self-checkout options in her retail stores. Did you know she was the first designer to live-stream her fashion show in virtual reality? She is a great example of harnessing and applying the power of technology in an industry where very few other people would consider trying. Because of her originality and commitment to women in STEM she has become a huge player in e-commerce and someone who inspires young girls. Entrepreneurship is oftentimes viewed as male-dominated and to have a woman making these kind of strides in such a competitive industry is something I hope everyone can admire. What advice do you have for other ambitious collegiettes with a goal/dream? Go for it! It’s going to be a ton of hard work and at times it is not as glamorous as you may think, but if you are pursuing something you have a passion for it is all worth it. You need to have a passion for what you do. Without it it’s very easy to give up when things get rough. It is important not to get discouraged, every failure is a learning experience. Passion and hard work are my formula for success—I highly recommend it. What are your plans for Snipped and Styled long-term? I am always looking toward the future. In the next year I will graduate from college and hope to expand Snipped and Styled. As I grow and evolve I see the company growing with me. For instance, I recently launched a line of everyday wear. I will definitely continue making Snipped and Styled collegiate clothing and hope to expand my more mature line, Snipped “Basics”. My customers who have followed my story from the beginning have been growing up with me and I want to continue to fulfill to their needs. Many will be graduating from college soon and will need clothing not only for tailgates, but for everyday life after college. I want to continue using Snipped and Styled to help charitable causes. I hope that as the business grows we will be able to do more in the way of charity. I feel very strongly about giving back. I love collaborating with other female entrepreneurs and want to continue doing so. I have found it so important to help promote other entrepreneurs. I have been very fortunate to have wonderful female role models and I hope I can be the same for other young girls. I have always dreamed of being a true “Girl Boss” and strive to be one soon. How would you describe yourself in five words? Passionate, outgoing, compassionate, ambitious and fun. Hannah is a senior studying marketing and English at the University of Washington and is the Editor of the UW Her Campus chapter. She was also a Summer 2017 editorial intern for Her Campus Media. When not editing, writing, or pitching articles, she's probably at brunch or the library.